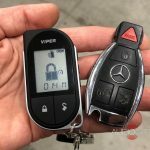 A Minot client sought us out to put a remote start in his 2012 Mercedes C300 after seeing our great online reviews from customers. These reviews from previous clients, as well as being the only place recommended by the local Mercedes and Audi car dealerships. show we care about the quality of our work. 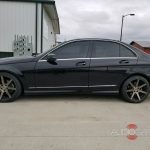 We specialize in Mercedes, Porsche, BMW and Audi installations, and can handle any other type of vehicle as well. After discussing some options with the client, we helped him choose a Viper 4706V Auto Start, which has a one-mile range, with included remotes and offers the ability to upgrade to unlimited range via the Viper Smart Start app in the future. The work we perform does not void your vehicle warranty, and our professional technicians make sure every connection made is secure. If you would like to talk to us about adding a remote start to your vehicle, swing by the store or contact us by clicking here.